Guthrie worried that Obama was "pre-settling" and that, "He's making a political calculus about what he thinks might be able to pass and not getting out there and fighting for what he thinks is best of the economy." Gibbs responded: "...the President's going to fight for exactly what he believes is best for the economy because he's done that every single day he's been president. But you just mentioned it, Savannah. What can get through Congress?" 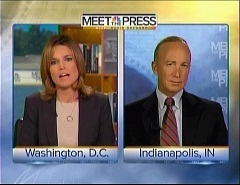 In contrast to her exchange with Gibbs, when Guthrie interviewed Indiana Governor Mitch Daniels minutes later, she actually discouraged Republicans from standing on principle: "...at the Republican debate the candidates were asked whether they would accept a deal in which there were $10 of spending cuts for every $1 of tax hikes. And every single candidate raised their hand....does that convey a sense that Republicans are so intransigent on this issue that this problem they profess to care about, i.e. the deficit, can't be solved?" Daniels countered by pointing to stubbornness on the Democratic side: "Well, first, there's tons of intransigence on the other side. The Democrats have been utterly, I'd say, not only stubborn, but cynical in their protestations that they won't touch, they won't, they won't modernize or rebuild the safety net programs, and everyone knows that has to happen." 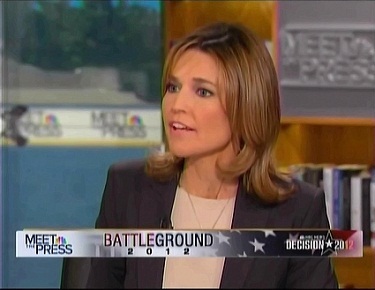 SAVANNAH GUTHRIE: Well, we don't know what it is in the President's jobs plan, but you mentioned he wants to extend the payroll tax cut. We know that. He's talked about patent reform, getting some trade deals passed. All of that, in some sense, will help with the jobless situation, but it's not enough to really make a huge dent in it. I guess the question is, if the President thinks more should be done, if he thinks there should be more stimulus, why doesn't he just go for broke? Why doesn't he go out there and ask for it, make a case for it? I mean, in some sense, is he pre-settling? He's making a political calculus about what he thinks might be able to pass and not getting out there and fighting for what he thinks is best of the economy. 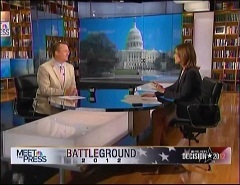 ROBERT GIBBS: No, Savannah, I think the President's going to fight for exactly what he believes is best for the economy because he's done that every single day he's been president. But you just mentioned it, Savannah. What can get through Congress? GUTHRIE: You know, recently at the Republican debate the candidates were asked whether they would accept a deal in which there were $10 of spending cuts for every $1 of tax hikes. And every single candidate raised their hand saying they would not take such a deal. My question to you is, is this tenable? I mean, you're a former budget director, you know the deficit problem better than anyone else. I mean, does that convey a sense that Republicans are so intransigent on this issue that this problem they profess to care about, i.e. the deficit, can't be solved? MITCH DANIELS: Well, first, there's tons of intransigence on the other side. The Democrats have been utterly, I'd say, not only stubborn, but cynical in their protestations that they won't touch, they won't, they won't modernize or rebuild the safety net programs, and everyone knows that has to happen.